The World Tourism Organization (UNWTO) is an international organization created in 1975 that aims to promote tourism. Formally linked to the United Nations since 1976 when it became an executive agency of the United Nations Development Program. In 1978, UNWTO established a first environmental plan. Since then, UNWTO, together with The United Nations Environment Program (UNEP), has made recommendations and has taken steps towards a tourism industry that is more aware of its impacts. Sustainable tourism is a form of tourism that follows the principles of sustainability. Sustainable tourism is an industry committed to making a low impact on the local environment and culture while contributing to generate income and employment for the local population. Solidarity tourism is understood as a way of traveling that is based on the respect of the travelers towards the people and places visited by a deeper approach to the reality of the country and a positive cultural exchange between both parties. Contributing to the economic development of an area is choosing accommodation in places managed by the community, consuming fair trade products and visiting and collaborating in solidarity projects that are carried out there. Finally, it is a way of traveling that has a positive impact in both, the communities visited and the traveler itself. 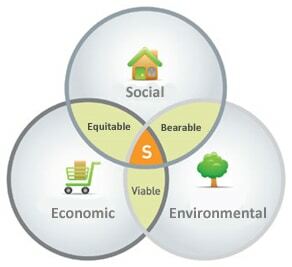 What are the types of sustainability? It refers to the ability to maintain biological aspects of productivity and diversity over time. Hence, to take care of the preservation of natural resources by promoting a conscious responsibility for the ecological aspects and, at the same time, taking care of the environment where it lives. It refers to the ability to generate wealth in sufficient quantity and equality among different social spheres for the population to be capable and responsible for its own economy. This in order to strengthen production and consumption in the sectors of monetary production. In a few words, the economic sustainability is a balance between Humans and nature where both work together so they don’t sacrifice future generations. Political Sustainability is a distribution of political and economic power. Making sure there are consistent rules in the country, a safe government and establishing a legal framework that guarantees respect for people and the environment. In this way, harmony between communities and regions will be increased and will improve the inhabitants’ quality of life. Also, this will make the communities more independent thanks to democratic structures. Preserve natural and cultural resources for future use. Plan and manage tourism development so that it does not cause serious environmental or socio-cultural problems. Maintain a high level of satisfaction among travelers and ensure that the destination retains its prestige and commercial potential. Redistribute the benefits of tourism within society. Reverse environmental degradation and maintain the basis of the material for the development. Promote a better understanding of the importance of ecosystem diversity. Implement measures to address local environmental problems. Improve the monitoring of the environmental impact of the production activities. Respect the socio-cultural aspects of communities and especially indigenous. Respect gender equality in development and project management. Racial, ethnic and religious equality. As a measure of welfare, it takes the quantity of material good and useful services produced by a country, divided by the number of its inhabitants (what is known as GDP per capita) or some measure directly related to it.